Things Are Getting Chaotic Around Here! Due to the Games Workshop’s change from resin teams to plastic, it might still be a little while before the Elf Union team hits shelves. 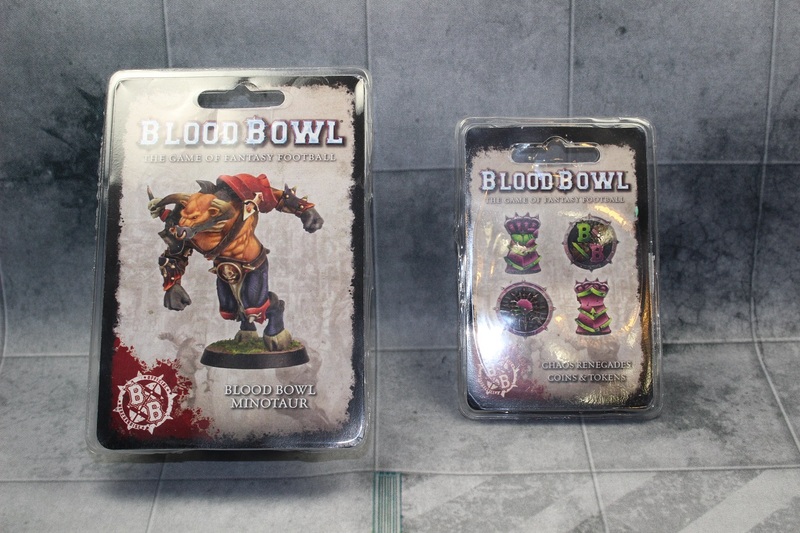 Luckily, in the meantime, we’re still getting fairly regular releases for Blood Bowl. Recently Forge World put the Chaos Renegades Coins & Tokens set and the rookie Minotaur up for pre-order, and today, a box from the UK showed up in my mailbox! My turn for Under the Brush! Well, more like Under the Exacto/Snips as these guys haven’t even been primed yet. OK, technically a few of them were primed before I started working on them. This bunch of brutes is my Chaos Renegades (formerly known as Chaos Pact) team the Silver Tower Denizens. See what I did there? Tying together two of Games Workshop’s recent boxed games … their season is over, but I plan on playing them again next season, hopefully I can get them painted up by then as we’re in something of a break. Read on for more pics!